Every year, the prominent foundation "Nadání Josefa, Marie a Zdeňky Hlávkových" is awarding Honorary Medals to nestors and founding personalities of the Czech science and art for their lifelong work. Among those who have been awarded the Medal on 16 November 2013, the eve of the National Day of Struggle for Freedom and Democracy, was Professor Miroslav Fiedler, the distinguished member of Department of Mathematical Logic, Algebra and Theoretical Computer Science. Pavel Pudlák has been awarded ERC Advanced Grant "FEALORA – Feasibility, logic and randomness in computational complexity" for 2014–2018. Another great success: the second ERC Advanced Grant in the Institute of Mathematics and – as in the previous year – the only one awarded to the Czech researcher in 2013. Research of Pudlák's team is motivated by the major unsolved problem in computer science called "P versus NP". They are looking for connections between the computational complexity and the proof complexity which represent two different views of the general phenomenon of complexity. A call for a post-doc position and for a Ph.D. student position within the FEALORA grant has been opened. Eduard Feireisl's ERC Advanced Grant proposal "MATHEF – Mathematical Thermodynamics of Fluids" has been selected for funding in the period 2013–2018. A great success of the Czech mathematics as this is the first ERC Advanced Grant for mathematics in the Czech Republic and the only one assigned to a Czech scientist this year! Eduard Feireisl was the chair of the Scientific Committee of the 6th European Congress of Mathematics in Kraków, 2012, and is also the chair of the Scientific Committee of Equadiff 13 in Praha, 2013. The call for a PhD. student to work in the grant has been closed. The Neuron Foundation for Support of Science and Research awarded the Neuron Prize 2013 for the Longlife Work to Prof. RNDr. Vojtěch Rödl, CSc., the renown Czech specialist in combinatorics and graph theory working at the Emory University in Atlanta. Doc. Mgr. Michal Koucký, Ph.D., has been awarded the Neuron Research Grant 2013 from the Neuron Foundation for Support of Science and Research. On the occasion of the World Development Information Day, 24 October, President of the Academy of Sciences of the Czech Republic Prof. Jiří Drahoš awarded the Prize for promotion and popularization of research, experimental development and innovations to prof. RNDr. Michal Křížek, DrSc. for his long-standing systematic popularization of mathematics and related fields. See the list of his publications. Ing. Jakub Šístek, PhD., received from the President of the Academy of Sciences Prof. Jiří Drahoš the Otto Wichterle Award for young researchers. The award connected with a financial premium of 90 000 crowns in the three subsequent years has been established in 2002 to encourage and support young promising researchers in institutes of the Academy of Sciences. Jakub Šístek is one of 23 young researches awarded the Award this year. Tradičních Dnů otevřených dveří v Matematickém ústavu AV ČR, které jsou součástí Týdne vědy a techniky Akademie věd ČR, nejrozsáhlejšího vědeckého festivalu v České republice pořádaného Akademií věd ČR ve spolupráci s dalšími institucemi, se ve dnech 5., 7. a 8. listopadu 2013 zúčastnilo více než 600 návštěvníků. V celkem 24 přednáškách a interaktivních seminářích se dozvěděli o zajímavostech ze světa matematiky a jejího uplatnění v nejrůznějších oborech lidské činnosti. Traditional Open Houses in the Institute of Mathematics AS CR held on 5th, 7th and 8th November 2013 in frames of the Week of Science and Technology, the most extensive scientific festival in the Czech Republic, organized by the Academy of Sciences of the Czech Republic in cooperation with other institutions, were attended by more than 600 visitors. In total of 24 lectures and interactive workshops, they learned about news from the world of mathematics and about apllications of mathematics in various fields of human activity. The Norwegian Academy of Science and Letters has decided to award the Abel Prize for 2013 to Pierre Deligne, Institute for Advanced Study, Princeton, New Jersey, USA, “for seminal contributions to algebraic geometry and for their transformative impact on number theory, representation theory, and related fields”. Vyhlášení veřejného výběrového řízení na obsazení funkce ředitele Matematického ústavu AV ČR, v. v. i.
Rada Matematického ústavu Akademie věd České republiky, veřejné výzkumné instituce, vyhlašuje v souladu s § 18 odst. 2 písm. h zákona č. 341/2005 Sb. veřejné výběrové řízení na obsazení funkce ředitele pracoviště. Přednáška ředitele Ústavu pro jazyk český AV ČR doc. RNDr. Karla Olivy, Dr., kterou Česká matematická společnost ve spolupráci s Matematicko-fyzikální fakultou UK pořádá v rámci série přednášek "Matematika a ...", se koná v pondělí 9. 12. 2013 v 16 hod. v refektáři budovy MFF UK v Praze 1, Malostranské nám. 25. Pending final approval by the European Research Council up to 4 years Ph.D. student position is available within the framework of the ERC Advanced Grant Feasibility, logic and randomness in computational complexity under the direction of Professor Pavel Pudlák. See description of the project. Pending final approval by the European Research Council a one year post-doc position is available within the framework of the ERC Advanced Grant Feasibility, logic and randomness in computational complexity under the direction of Professor Pavel Pudlák. See description of the project. Tradiční Dny otevřených dveří v Matematickém ústavu AV ČR jsou součástí Týdne vědy a techniky Akademe věd ČR, nejrozsáhlejšího vědeckého festivalu v České republice pořádaného Akademií věd ČR ve spolupráci s dalšími institucemi ve dnech 1.–15. listopadu 2013. Široká veřejnost a především studenti středních škol mají možnost nahlédnout do pracoven, laboratoří a knihoven a poznat, jak se dělá věda. Badatelé z výzkumných pracovišť AV ČR připravují širokou nabídku exkurzí, přednášek, výstav a diskusních večerů, ve kterých představují své výzkumné projekty, předvádějí nejmodernější vědecké přístroje a experimenty a přibližují návštěvníkům nejnovější trendy v oblasti vědy. V Matematickém ústavu AV ČR se Dny otevřených dveří uskuteční na pražském pracovišti ve dnech 7. a 8. listopadu, v brněnské pobočce 5. listopadu 2013. Traditional Open Houses in the Institute of Mathematics AS CR will be held as part of the Week of Science and Technology, the most extensive scientific festival in the Czech Republic, organized by the Academy of Sciences of the Czech Republic in cooperation with other institutions from 1st to 15th November 2013. The scientists from the research workplaces of the Academy of Sciences prepare a wide offer of lectures, presentations, panel discussions, seminars, excursions, exhibitions and discussion evenings, in which they present their research projects, the most modern scientific apparatuses and outline for the attendees the latest trends in the areas of science in the Czech Republic and the world. The Prague departments of the Institute of Mathematics will be open to public on 7th and 8th November, the Brno branch on 5th November. A position is available for a Research Fellow to work at one of the topics developed in the Institute of Mathematics AS CR. A Visiting Scholar position is available in the Institute of Mathematics AS CR in Prague in 2014, with the duration of the contract from six to twelve months. A two year postdoctoral position within the Academic Human Resource Programme of the Academy of Sciences of the Czech Republic is available starting from January 1st, 2014. Under the name "Equadiff", two series of important international conferences on differential equations have been organized every two years alternatively in Eastern and Western Europe during the last decades. The next Equadiff 13 takes place in Prague in the period August 26–30, 2013. 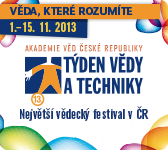 Registration has been opened at http://equadiff.zcu.cz/?obsah=regis. For further information visit http://equadiff.zcu.cz/. During August 2013, the Institute of Mathematics is using a shop window in the Academia Publishing House in Prague, Vodičkova Street, to promote mathematics. The exhibits documenting activities carried out in the Institute and selected achievements is accompanied with a series of short film ilustrating the beauty of mathematics. The conference AM2013 in honor of the 70th birthday of Karel Segeth will be held on 15-17 May 2013 in the Institute of Mathematics AS CR. The summer school for Master and PhD students and other persons intersted in mathematical models of reaction and reaction-diffusion systems and their aplications will be held in the Institute of Mathematics AS CR from 6th to 8th August 2013. A one or two year postdoctoral position within the Academic Human Resource Program of the Academy of Sciences of the Czech Republic is available starting from July 1st, 2013.